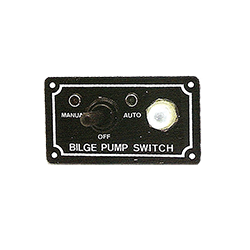 3 Way Bilge Pump Switch with 10 Amp Breaker. On-Off-Auto. Marine grade tin wire and aluminum face plate. Booted toggle switch 3-1/4" x 2". L.E.D. power indicators.